O2 Wireless Box II is the wireless router provided for the O2 customers who sign up for Standard and Premium broadband packages.O2 Pro broadband customers get Wireless Box III which comes with similar features except that it adheres to the advanced, wireless ‘N’ standard. O2 Wireless Box II is a customized version of Thomson SpeedTouch TG585 v7 wireless router, configured to access O2’s ADSL 2+ broadband network. It can operate in both 802.11b and 802.11g network environments. As we said, O2 Wireless III box router comes with 802.11n spec, however, following specification is common to both O2 Wireless II Box and wireless III Box routers. Latest firware verson for O2 wireless Box II is 7.4.20.4 which can be downloaded. 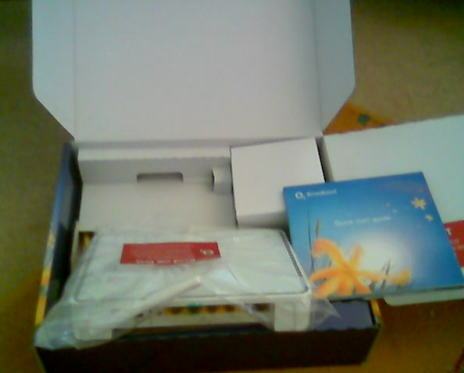 Once signed up with O2 home broadband, you will get O2 wireless box with a setup CD. The CD provides you with essential information on how to connect wireless box. You can install O2 Broadband Assistant software, run wireless connection wizard and load McAfee Internet security. O2 has pre-configured basic and security settings in Wireless Box, so it would run as soon the connection is established. How to change admin password in O2 wireless box? As you know, the wireless box comes with default password which you can change to ensure better security. Make sure the O2 wireless box router is connected to phone line and PC. You can access the wireless box settings, by typing or on your browser. New screen appears, now, click on ‘Toolbox’ from the left side menu. Type both your old password and new password in the required fields. Once the new password is registered, you will be returned to the ‘User management’ area. Now, you will need to enter new password to change any settings on your router. How to upgrade your router to the new firmware? It is important that you use the latest firmware version for your O2 Wireless router. It takes a couple of minutes to download the required updates, but it ensures higher levels security and performance, nevertheless. To download the most recent version of software for your router, visit https://o2wirelessbox.lan. Enter the password (it will be the serial number, if you still use the default password). Download the .exe file and just double click it. The flashing will start soon and the firmware upgrade will be completed in a few minutes. O2 Wireless Box router modem needs to be returned to O2, when you leave the provider.